Forgotten password? | From your company area you can update your offer, add company logos and manage all your listing on the service. Support a great community that supports our country. Offer a discount for the NHS, Emergency Services and Armed Forces. There is no charge to get involved and offer a discount for the Armed Forces Community. Your company is listed on both the website and app. If you have a physical store you store location is plotted on our map. Accept the card below in store, each card will have the members name, card number and expiry date. Also Supporting the Armed Forces and Veterans? 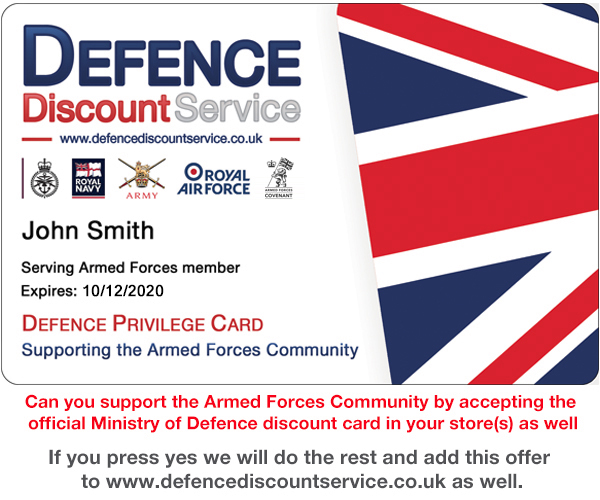 Can you support the Official MoD discount service (Defence Discount Service)? To save you time, we can add this offer to www.defencediscountservice.co.uk free of charge for you. Can we send you news and information about our services? It is free to offer a discount to the Blue Light Card Community. If you are an online retailer please complete the form below, once complete you will be then able to login to add an offer to the website and mobile application.